The goal of US-based company FK Irons is to provide professional tattoo artists with the best tools available. They guarantee that the investment will always be protected with a lifetime warranty. FK Irons are the creators of the Spektra Halo, which is the first autoclavable tattoo machine, thanks to the detachable motor body. They have now added the FK Irons Delta Footswitch, a heavy duty foot switch which is designed to be extremely robust. It comes with the usual lifetime warranty. Of course, they are based in the USA, if the switch does fail then getting it fixed or replaced could possibly take a month or more. 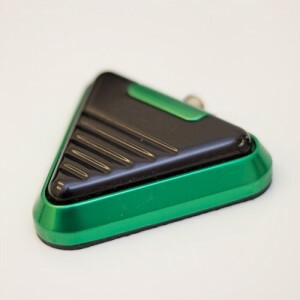 At £108 the foot pedal is very pricey but it could mean you never have to buy another. It is made from aircraft grade aluminium, so it is both lightweight and durable. The fact that it is very light makes it perfect for travelling and conventions. 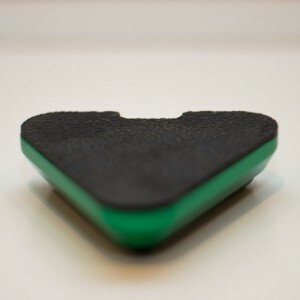 Unfortunately, it weighs so little that the anti-skid pad can’t always keep it in place. It is very responsive thanks to the dual springs and hinge system, and it has a great connection. A faulty cable no longer causes the whole unit to fail. If a cable breaks all you have to do is plug in a new RCA cord and it is fit to work with again. The problem with the RCA cord is that it seems to come out of the FootSwitch quite often which is irritating and disruptive for the tattoo artist having to stop and reconnect it. It has an attractive design and comes in a range of colours. This may not affect the way it works but it’s a nice touch.